Yes, it’s true. Oak hardwood floors are the hottest trend in wood flooring. Oak has managed to reinvent itself into a modern look, disguising itself so well that most clients can’t believe it’s oak they are getting excited about! If you’ve previously described yourself as being “oaked out,” this article might help you reconsider. Stain Color: Color is the number one deciding factor when selecting a hardwood floor. Today’s prefinished oak floors are factory finished with stain colors that are soft and muted (no more orange)! Colors vary from light to medium browns, greys, natural wood tones, and even beachy, white-washed colors. Many are finished with dual stain colors to provide depth and interest. This two-tone style ranges from barely noticeable (minimal and quiet) to extreme shade variation (dramatic and bold). 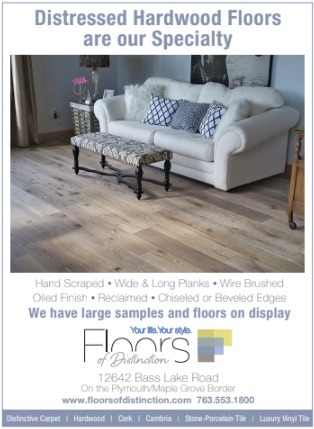 Wide Plank: The number one selling width in oak flooring is currently 5 inches wide. 5 inches is now considered “the new narrow,” with popular widths ranging from 5 – 12 inches, overall. This wider scale will make your home feel large and expansive, which is perfect for small spaces, open layouts, and for homeowners who want to install wood floors throughout their main level. If you’re on the conservative end of the design spectrum, a 5” plank will feel more “classic.” If you’re more daring, choose a 7 ½” or wider size to get that “modern rustic” look. Distressed Style: Hand scraped, hand sculpted, and wire brushed textures are chosen more often than smooth finishes in today’s market. These beautiful textures provide interest and style but also camouflage wear and tear. If you have an active home with kids and pets, you won’t have to worry about every dent and scratch showing. When accidents happen, they simply blend in and add more character and charm to your floor! Dull Finishes: Shiny, glossy finishes on oak floors are a thing of the past. Today’s oak floors feature satin and matte finishes. The satin finish will “bounce” more light than the matte finish. To some clients, the matte finish will appear “unfinished.” For a slightly less casual look, satin might be the better choice. Both options are meant to have that “farmhouse” feel, and once again, hide scratches and imperfections. I’m often asked where to start when searching for a new hardwood floor. Designers can help you find your style identity by listening to your goals and visiting your home. If you prefer to shop for yourself, large samples are the key. To see the nuance of texture, color variation, and sheen level you really need to see a big sample in your home so that you know what you’re buying. You might just find yourself giving oak another chance!